The Pakistan Sikh Gurdwara Parbandhak Committee (PSGPC) has extended support to a separate gurdwara committee for Haryana, claimed HSGPC (ad hoc) chief Jagdish Singh Jhinda. The controversy over a separate gurdwara committee for Haryana is turning into a major conflict between Sikhs owing allegiance to different political parties in Punjab and Haryana. The Haryana Government’s firmness not to back off from the Haryana Sikh Gurdwaras (Managment) Act in the face of objections to it by the Centre and Punjab stems from its confidence on account of the recommendations of its Cabinet sub-committee. HSGPC (ad hoc) leader Joga Singh has said Sikhs of the state does not confrontation with the SGPC task force camping at main gurdwaras in the state. In a setback to the Congress in Hisar district, Kulbir Singh Beniwal, a former MLA and a prominent face in the Adampur assembly segment, today left the party. He is slated to join the INLD. The Haryana Power Engineers Association (HPEA) has resolved to restart the agitation after they failed to get any assurance from the government on their long-pending demands. The Faridabad Industrial Association (FIA) has offered to be a nodal agency for rehabilitation of over six lakh persons residing in slums and unauthorised colonies. This offer comes in wake of unchecked growth of such clusters and encroachments. 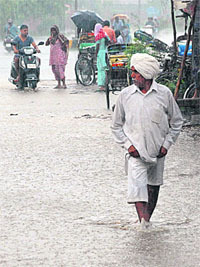 Rain showers lashed Ambala City and its outskirts on Wednesday flooding low-lying areas and throwing normal life out of gear. Waterlogging on some roads made plying of vehicles and movement of pedestrians difficult. According to the Agriculture Department 59 mm rainfall was recorded today. First rain in the district has belied tall claims of the Irrigation Department vis-a-vis effective measures to deal with flood-like situation. Not cleaning seasonal water channels before the season showed its ill-effects with a few hours of rain. Continuing with its spree of rehabilitating retired bureaucrats on plum postings, the Hooda Government today shortlisted atleast four former officers for appointment as State Information Commissioners (SICs) and Right to Service (RTS) Commissioners. Besides, the wife of a politcal adviser to the Chief Minister was also adjusted as an SIC. Activists of the Haryana Lokhit Party (HLP) held a demonstration and burnt an effigy of Karnal BJP MP Ashwani Chopra here today for starting a campaign against their leader Gopal Kanda in a vernacular newspaper, owned by him. Angrez Bathla, state vice-president of the party and a municipal councillor from Sirsa, led the demonstration. The HLP workers assembled at Subhash Chowk in Sirsa and raised slogans against the BJP MP. In an embarrassment to the Haryana Pradesh Congress Committee (HPCC) and Chief Minister Bhupinder Singh Hooda, spokesman for the HPCC Karmbir Saini accused Hooda of regional discrimination and resigned from the party today. Saini sent his resignation to the committee chief. Rakesh Sardana, municipal councillor and a close confidant of local MLA and minister Randeep Singh Surjewala, along with his supporters, staged a dharna outside the municipal council office here today to protest alleged discrimination in development works in his ward. Three other councillors — Pardeep Sharma, Vijay Pal Sharma and Krishan Gandhi — also joined Sardana. The Aam Aadmi Party’s (AAP) decision against contesting the upcoming Assembly elections in Haryana has disappointed the party cadre in the state. The Food Corporation of India (FCI), Haryana region, saved Rs 1,400 crore of the Centre towards maintenance and preservation charges of the wheat stock in the state, procured during 2014-15 season. The Congress began its election exercise in Haryana on a balancing note with party president Sonia Gandhi approving the inclusion of senior rebel leader Birender Singh among members of the crucial state poll manifesto committee. Ahead of the statewide meetings on July 25, senior Haryana BJP leaders met here today under the chairmanship of state unit president Ram Bilas Sharma to finalise various committees and campaign schedules of Central ministers for the coming Assembly elections. Irked at the alleged delay in promotions under the career advancement scheme, teachers continued their dharna outside the office of Chaudhary Devi Lal University Vice Chancellor for the second day today. The Comptroller and Auditor-General(CAG) has detected a ‘scam’ in the coaching of over 9,900 SC and Backward Classes (BC) students for competitive examinations by private coaching institutes. Terrorist Abdul Karim alias Tunda (70) was today produced in the court of Additional Sessions Judge Jagdeep Singh amid tight security. As his counsel in the case was not present, September 22 has been fixed as the next date of hearing in the case. Acting on a bail petition filed by Swami Aseemanand, accused in the Samjhauta blast case, the Punjab and Haryana High Court today called for details of the witnesses examined in the cases and a copy of the challan. The Punjab and Haryana High Court has commuted the death sentence of two youngsters to life imprisonment. They were convicted in a triple murder case. The Haryana Lokayukta, Justice Pritam Pal, today fixed August 4 as the date for seeking replies from five Congress leaders, accused in the alleged cash-for-CLU scam. Shushil Kumar (46), Assistant Sub-Inspector in the Haryana Police, was today shot dead allegedly by his nephew Sahil and two others while the victim was coming out of his house in Baiyanpur village. Ayurvedic Medical Officers (AMOs) working in the AYUSH department are up in arms over the government’s alleged apathy towards their demands. The arrest of a school teacher accused of molesting a student and of the victim’s father in a cross case lodged by the teacher’s wife has raised many an eyebrows. “The PSGPC chief has expressed his willingness to come to Karnal for a convention on July 28. He will attend the convention if he manages to get the visa,” he told The Tribune. “After learning the outcome of the SAD’s Panthic convention on July 27, the strategy of the Karnal’s convention at Dera Karsewa will be finalised,” Jhinda said. The July 28 convention would see the participation of intellectuals across the country and abroad, he said. “Five retired judges are expected to join in. The HSGPC (ad hoc) will request the Akal Takth Jathedar Giani Gurbachan Singh to attend the event. “Shanti March” (peace march) supposed to be taken out in the city today was cancelled. Manji Sahib Gurdwara president Balkar Singh Assandh has said that there is no need of a separate gurdwara committee for Haryana, as the Shiromani Gurdwara Parbhandhak Committee (SGPC) is managing all shrines in the state efficiently. He ruled out the diversion of funds from Haryana gurdwaras to Punjab and said the shrines received sufficient funds from the SGPC. “Manji Sahib Gurdwara (one of the historical gurdwara in Karnal) has its own committee that governs the shrine and takes all decisions. We meet our expenses ourselves and, in need of help, the SGPC pitches in,” he told the media here today. Singh said all employees at Manji Sahib Gurdwara were from Haryana and there is no discrimination against anyone. “Akal Takht is a supreme body of the community, but the Congress-led state government is trying to divide it by forming a separate committee, which is against the law,” he said, adding that the community had scarified a lot and would not tolerate any move to create divisions. Claiming the state government’s move was unlawful, the Manji Sahib president said the state government was not unauthorised to pass a Bill related to a separate committee. The situation is so far peaceful, but rising tempers and “frustration” among those who see the process as being irreversible has led to calling of Sikh sammelans that will charter the next course of action. The SAD has called a mega Sikh convention from all over the world to debate the issue of the Haryana Government meddling with the internal affairs of the Sikhs and to decide what course of action to follow to “undo” the fallout from the passing of the Haryana Sikh Gurdwara (Management) Bill, 2014, by the state Vidhan Sabha and the Haryana Governor giving his assent to the Bill. This vishal Panthic ikath of Sikhs from all over the world will be held at the Golden Temple complex in Amritsar. The decision was taken at a five-hour-long meeting of the Akali Dal core committee on July 19 to continue building pressure on Haryana. In view of the call for a sammelan, the SAD too has announced it would hold a parallel conclave in Amritsar on July 27 in which Sikhs from Rajasthan, Uttar Pradesh, Delhi, Punjab, Haryana, Chandigarh and other states would be asked to deliberate if they want separate management bodies in their respective states or they would like the control of all gurdwaras stay with the SGPC. Jaswant Singh Mann, secretary general, SAD (Amritsar), said the decision was taken at a meeting at Fategarh Sahib today under the patronage of Simranjit Singh Mann and Kashmir Singh Patti, who is in charge of the specially formulated SGPC panel of the party. He said the party felt the conflict among the Panth was a result of the Badal family trying to keep the SGPC under its control. At the same time, the Sikhs in favour of a separate gurdwara panel and those supporting Bhupinder Hooda government has called a Sikh sammelan to review the developments arising from the presence of the SGPC task force in gurdwaras of Haryana. It would deliberate and counter the decision taken in Amritsar by the SAD and SAD (Amritsar) in their respective conclaves. In this entire controversy, the “edict” by Akal Takht against Sikh leaders of Haryana has taken a back seat. Chief Secretary SC Choudhary told The Tribune that the atmosphere in the state would not be allowed to be vitiated. “So far, the protests have been peaceful, but the government is taking all precautions to counter any adverse law and order situation,” said Choudhary. Its recommendation was the fulcrum that enabled the state propel the Haryana Vidhan Sabha to legislate Haryana Sikh Gurdwaras (Management) Bill, 2014, into an Act. The sub-committee, chaired by minister Randeep Singh Surjewala, concluded in its report that the state was within its right to constitute a separate Sikh body through an Act to manage the community’s affairs. As per its report submitted to the government, the major conclusion is that the Sikh Gurdwara Act, 1925, is a “state” enactment. This is diametrically opposed view propounded by Punjab Chief Minister Parkash Singh Badal, the SGPC backed by the ruling Akali Dal in Punjab who have stated it to be a Central Act. The report says the 1925 Act is a pre-Constitutional “state enactment enacted by Punjab Legislative Council”. Post-Independence, this state enactment has been subjected to 14 amendments by the legislature of the joint state of Punjab. The committee further concluded that the Punjab Reorganisation Act, 1966, vests power in the “successor” state (read Haryana) with the power to enact a separate Act for creation of a separate Sikh body for Haryana. “After the passage of Haryana Sikh Gurdwaras Management Bill in the Assembly, Sikhs of the state are excited to take possession of the shrines. But the HSGPC (ad hoc) doesn’t believe in shedding blood. Therefore, Sikh leaders have asked members of the community to remain calm,” said Singh. contested the 2011 byelection from Adampur against HJC’s Renuka Bishnoi and stood second by polling 27,607 votes. Addressing workers at the PWD Rest House today, Beniwal alleged that the Congress leadership had been ignoring party workers and he was under pressure from his supporters to leave the party. 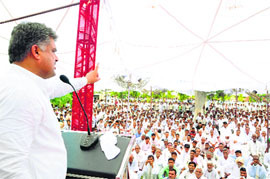 “I will join the INLD in the presence of senior party leaders soon, “ he said. Sources close to him revealed that Beniwal had been assured the ticket from Adampur as the INLD wanted a strong candidate in Adampur to contest against Bishnoi. President of the association, KD Bansal, said engineers would be holding gate meetings at zonal headquarters from Thursday onwards to start an agitation. The first gate meeting would be held tomorrow at Yamuna Nagar, Panchkula and Hisar, added Bansal. The first meeting of a three-member committee comprising Chief Secretary, Principal Secretary to the Chief Minister and Power Secretary was held on Monday to discuss the problems of power engineers. The three managing directors of the power utilities were also present in the meeting. The authorities are in a fix over the removal of hundreds of such houses in Palla area, where residents resorted to violence to protest demolition on July 13. “We had submitted a proposal to the state government a few months ago for being the nodal point to work out alternatives for those residing in unauthorised colonies in the city,’’ said Navdeep Chawla, the president of the FIA. He said the recent incident of violence during the removal of illegal colony in Palla area speaks about the gravity of the problem. Claiming that Faridabad had over six lakh persons residing in slum clusters or colonies, which lacked basic amenities, he said there was a dire need of launching a mass housing scheme for the people. He said the authorities could check growth of illegal colonies with the construction of multi-storey houses. Chawla demanded that the government should sanction a housing project near the recently developed IMT. Hundreds of acres owned by the Municipal Corporation were lying vacant in many areas, which could be used for housing for the poor, he added. The authorities have identified around 3,000 original allotees, who could not get plots in Durga Builders Colony here, where the demolition was carried out on July 13. Roads that were inundated with water, include Baans Bazaar Road, Bazaar Basti Ram Road, Wholesale Cloth Market Road, Grain Market Road, Old Civil Hospital Road, Court Road, Model Town Road, Nadi Mohalla and Nahan House area. Rain water entered in some shops and houses in low-lying localities. Schoolchildren had to face difficulty as the rain started in the noon when they were coming back home after schools were over. The moderate rain brought some relief for the people from the scorching heat wave, continuing for last fortnight. Farmers of nearby villages waiting for irrigating paddy also cheered up as they would be able to save their crops. An official of the Agriculture Department said rain would be beneficial for the paddy crop, facing acute shortage of water these days. 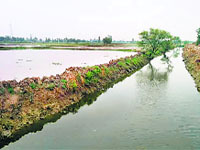 The Shamlo-Padana drain overflowed and newly sown paddy on acres of land got submerged in sewer water. Farmers sought a high-level inquiry into utilisation of lakhs, sanctioned for cleaning of water channels before the start of rain, and strict action against the officers concerned. “Lack of cleaning of seasonal drains has led to overflowing of dirty water. More than 60-70 acres are submerged under dirty water. Crop will be permanently damaged if we do not drain out dirty water immediately,” said Ajmer, a farmer of Shamlo Khurd village while pointing towards the submerged crop. Farmers alleged that residents of other villages, including Dhigana, Padana and Gosar Khera, located near the Shamlo-Padana drain, discharge sewage water into the drain. However, the failure of the Irrigation Department authorities in cleaning the drain before the start of monsoon has reduced the water carrying capacity of the drain and it overflowed with a little quantity of rainwater. The Irrigation Department had claimed a few days ago that they had completed 90 per cent of the work and have prepared estimates of Rs 1.86 crore under MNREGA for cleaning and strengthening of the canal system. “I along with affected villages met senior Irrigation Department officers many a time for cleaning of all drains, but not a single drain and other waters channels were cleaned before monsoon. Things will turn worse in coming days only because of officers, who have pocketed huge amounts of sanctioned funds,” alleged INLD MLA from Julana Parminder Dhull. When tried to contact Superintendent Engineer (SE) of the Irrigation Department Shravan Kumar, he refused to speak over cleaning of seasonal water channels saying that he was busy in a meeting. A high-level three-member committee headed by Chief Minister Bhupinder Singh Hooda zeroed in on the names of one RTS Chief Commissioner, four RTS Commissioners, and three SICs. Leader of the Opposition OP Chautala, also a committee member, was conspicuous by his absence. While Chief Secretary SC Chaudhary, whose extended tenure ends on July 31, was rewarded with the post of RTS Chief Commissioner, IAS officer Sarban Singh (due to retire later this year), Sunil Katyal, an audit officer and Lt-Gen VS Tonk, were shortlisted for the posts of RTS Commissioner. Former IAS officer Shiv Raman Gaur, currently adviser(Health) to the Chief Minister, was shortlisted for the post of SIC. On the other hand, Amar Singh Chaudhary, husband of a Judge of the Punjab and Haryana HC, and Rekha Rani, wife of Hooda’s political adviser, were shortlisted for posts of SIC. The Hooda Government’s haste in filling these posts is understandable as Haryana Governor Jagannath Pahadia is set to demit office on July 27. A notification would be issued soon and the new appointees would take oath before July 27, sources added. Meanwhile, management expert Mukesh Kumar Sehgal, who was one of applicants for a post of SIC, in representations to the Governor and the Chief Justice of the Punjab and Haryana High Court, demanded that the selection process should be stayed, terming it as eyewash. “No information regarding the procedure followed by the search panel was provided to the applicants and the names of nine persons shortlisted for selection were never uploaded on the Chief Secretary’s website. Om Prakash Chautala, Leader of the Opposition and a member of the high-level committee for the selection of SICs, today termed the recommendation of the names for constitutional posts as “unethical and unacceptable” at the fag end of Hooda Government’s tenure. In two letters to the Chief Minister, Chautala alleged that the government appeared to be adamant to pack the commissions with ineligible and incompetent persons . “Such moves of parking your favourites in constitutional positions with a huge financial burden to be borne by the public may lead to avoidable litigation,” he said. 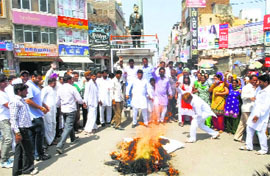 Activists of the Haryana Lokhit Party (HLP) held a demonstration and burnt an effigy of Karnal BJP MP Ashwani Chopra here today for starting a campaign against their leader Gopal Kanda in a vernacular newspaper, owned by him. Angrez Bathla, state vice-president of the party and a municipal councillor from Sirsa, led the demonstration. The HLP workers assembled at Subhash Chowk in Sirsa and raised slogans against the BJP MP. Party leaders alleged that a campaign was launched against their leader due to ulterior motives. A senior HLP leader, Krishan Saini, said Gopal Kanda’s father Murli Dhar Kanda was an RSS volunteer and had contested Assembly poll in 1952 on a Jansangh’s ticket. He said the MP’s style of functioning as an editor had always been questionable and even the Leader of Opposition Om Prakash Chautala had filed a criminal complaint of defamation against him in a Sirsa court. 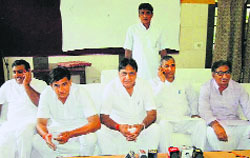 The HLP leaders demanded that the BJP should expel the MP from the party. “Despite repeated requests of party workers and leaders, Hooda is not ready to provide equal funds to all areas. He only wants to see development in Rohtak. It is discrimination with other areas of the state,” alleged Saini while interacting with mediapersons in a local hotel. Saini, who had been a confidant of CM before leaving the party, alleged that the Chief Minister had formed the HSGPC only to create tension in the state and not for the welfare of Sikhs. Saini had fought the Assembly election from Safidon in 2005, but lost. He had 20-year-long association with the Congress and since his joining the party, he had remained loyal to Hooda. “The CM has formed the HSGPC only for political gains and it will create serious law and order problem in the state,” alleged Saini. Saini alleged that the CM had constructed many railway overbridges (ROBs) in Rohtak, but Jind had not got a single ROB since the Congress came to power. “The Jind bypass is lying incomplete for the past seven years, but the CM claims that Jind has seen development under his leadership,” he maintained. He alleged that the CM had been playing in the hands of some middlemen, who only want to mint money. Serious workers had no say in the government. “The CM is not ready to control money-minting leaders and ignoring serious party workers,” alleged Saini. On being asked that why he remained silent for so many years, Saini said he hoped that the CM would change and undertake development in the entire state. He alleged that there was inordinate delay in the grant of approval for construction plans. He said though many development plans had been approved long ago and funds earmarked, no work had been started in his ward. In its meeting held at Karnal yesterday, the AAP announced that it would not contest the forthcoming elections, as the party’s central leadership wanted to concentrate on the Delhi elections. The announcement has come as a blow to hundreds of admirers of the AAP across the state, as they were expecting to do better in the state in the Assembly polls after getting 4.3 per cent vote share in the parliamentary elections despite a strong wave in favour of Narendra Modi. “I am really disappointed that despite strong desire by our team in Haryana as well as party volunteers, we are not contesting the polls. Efforts are still on to convince the central leadership, but there seem to be certain forces, which are trying to block our efforts. Perhaps, the party leadership wants to concentrate on the Delhi Assembly polls only,” said Rajiv Godara, spokesperson for the Haryana unit of the AAP. Poonam Chand Ratti, who contested the parliamentary poll from Sirsa on the AAP ticket, said the party’s announcement had come as a rude shock to the workers. “If we don’t contest these polls, we will have to start from a scratch in 2019. The state body has conveyed its sentiments to the central leadership and we still hope that the party may review its stand,” Ratti said. Another AAP activist said the BJP had won merely two seats in 1984, when Rajiv Gandhi won the parliamentary polls riding on sympathy wave. He said the victory on four seats by AAP in these parliamentary polls should not be underestimated, as this victory came against a strong pro-Modi wave. Meanwhile, political observers believe that the AAP’s decision is likely to harm the prospects of the ruling Congress in Haryana, while it will benefit the BJP as well as the INLD, as division of anti-incumbency votes among many stakeholders could have benefited the ruling party. According to an official source the FCI’s regional branch took over 33 lakh metric tonne (LMT) wheat procured from agencies of the Haryana government and saved the Union government from paying charges for carry over head for storage, maintenance and preservation of foodgrains. The 15-member panel cleared by Sonia Gandhi has among members Haryana Congress president Ashok Tanwar, Chief Minister Bhupinder Singh Hooda and three Hooda baiters — Birender, Rajya Sabha MP Kumari Selja and former Lok Sabha MP Shruti Choudhry, who finds a place instead of her mother Kiran Choudhry, a minister in the state. The committee will be chaired by Hooda loyalist Ram Prakash, a former Rajya Sabha member whose slot was given to Selja last year. The most important inclusion in the panel is of Birender Singh, whom the Congress wants to woo ahead of Aassembly elections. Birender, sources said, will be “omnipresent” in all election-related committees of the Haryana Congress as the party wants to prevent him from leaving. Birender is in talks with the BJP and the INLD for a possible switchover on the election eve. He is against Hooda’s continuation as the CM. By naming Birender in major committees, the party wants to keep its slate clean and give the only Congress Working Committee member from Haryana his due. The poll manifesto committee largely comprises Congress loyalists from different segments of Haryana. Among its members are Finance Minister HS Chattha, who played a major role in the creation of a separate gurdwara management body for Haryana; Industries Minister and Congress national spokesperson Randeep Singh Surjewala; and former Lok Sabha MP from Kurukshetra Naveen Jindal. Maman Khan, who was Congress candidate from Ferozepur Zirka in the Mewat segment in the last Assembly poll, is another member in the Haryana election manifesto committee which was approved by Sonia today. He will also represent the aspirations of the Muslim society. The other two members of the committee are Gyan Sahota, considered close to Ashok Tanwar; Renu Poswal, former vice-president of the All-India Mahila Congress and Rati Ram, a Gujjar leader currently chairing Khadi Board in the state. Sharma 39 ministers would address rallies in the state,” he said, adding that the BJP would target each one of 16000-plus polling booths in the state. BJP president Amit Shah has divided the state into four zones — Gurgaon, Panipat Ambala and Bhiwani—and given the responsibility of gathering feedback from each zone to senior Central ministers. The responsibility for Gurgaon zone has been given to Minister of State for Parliamentary Affairs Santosh Gangwar. Agriculture Minister Radha Mohan Singh will get the feedback from Panipat zone, senior leader JP Nadda from Ambala and Central ministers Sanjeev Baliyan and Narendra Tomar from Bhiwani. A meeting has been planned on July 27 when all the feedback will be assimilated and discussed. Vice Chancellor Radhe Sham Sharma said only nine out of the 67 regular teachers of the university had sat on a dharna while no guest faculty member was supporting the stir. He said he had already told the protesting teachers that the university would order promotions strictly as per the norms of the UGC. In its latest report tabled in Vidhan Sabha recently, the CAG alleged that 14 coaching institutes, which were paid Rs 5.22 crore for coaching, were selected ‘arbitrarily”. “The payment was made without verifying the eligibility and ensuring whether the coaching was provided or not,” the report alleged. In fact,a physical survey of 2,775 candidates by CAG teams revealed shocking details. As many as 1,031 candidates (90%) of the 1,145 candidates for the Hayana Teacher Eligibility Test (HTET) had neither applied for or availed coaching facilities. Similarly, 155 of the 248 candidates for the Diploma Entrance Test neither applied for coaching nor availed the coaching facility. As many as 42 of the 65 candidates for the Pre-Medical Entrance Test were not eligible for coaching as they had passed the 10+2 examination with arts subjects. In the case ofthe bank clerks examination, 307 (39%) of the 794 candidates had applied for coaching but did not attend classes. Moreover, 258 candidates had neither applied for nor availed the coaching facility. The situation Civil Services (Preliminary) Exam was no different with 49(35%) of the 141 candidates not getting any coaching. In the case Probationary Officers’’ examination, 15 out of the 154 candidates neither applied for nor received any coaching. The scrutiny of the record of 5,729 candidates showed that the state government had sponsored 822 candidates while for the HTET no candidate was sponsored. The terrorist was allegedly involved in two bomb blasts in Sonepat town on December 28, 1996, and around 15 persons were injured in the blasts. Appearing before the Division Bench of Justice Satish Kumar Mittal and Justice Mahavir Singh Chauhan, the National Investigation Agency told the court that 40 witnesses have been examined so far. The case will now come up on July 30. Swami Aseemanand is one of the accused in the Samjhauta Express blasts which took place on February 18, 2007. Counsel Anil Mehta and Padamkant Dwivedi argued that Swami Aseemanand’s name was not mentioned initially when the FIR was lodged on February 19, 2007, by the Railway Police. Declining the reference made by the Jhajjar District and Sessions Judge for confirming the death sentence awarded to Ajay Veer and Jai Ram, a Division Bench asserted: “Keeping in view the circumstances in which the crime was committed , we direct that accused Ajay Veer and Jai Ram shall spend a minimum of actual 20 years in jail and they shall not be entitled to parole for the first 10 years of their imprisonment to prevent them from committing similar crime”. The triple murder was fallout of old enmity between two families. The case was registered on the statement of Gulabo Devi, whose husband Hari Om, sister-in-law Krishna and nephew Naresh were killed on May 20, 2009, in Jassaur Kheri village of Jhajjar district. She had told the police in 2001 her brother-in-law was murdered for demanding money for cultivating land. In 2004, a compromise was struck in the panchayat, but the issue remained unresolved. Appearing as a prosecution witness, Gulabo, however, turned hostile and did not support the prosecution case. She said the accused did not commit the murder of her husband and others. But other two witnesses Krishna’s son, Ravinder, and Hari Om’s sister, Darshna, supported the prosecution case. It may be recalled that the Lokayukta, who had sought replies from the accused today, was informed that the the Punjab and Haryana High Court had stayed the passing of any order in the case till the next date (September 29) in the High Court. The order came in the case of Vinod Bhayana - one of the accused – who had challenged the proceedings going on before the Lokayukta. Justice Pritam Pal, however, sought to know whether the High Court had stayed the proceedings or a judgement in the case and sought their replies on August 4. The alleged accused reportedly fired three rounds at him. The police have taken possession of the motorcycle the accused left behind. The victim was taken to the Civil Hospital by his family members where he was declared brought dead. DSP Darshan Lal Malik said on the complaint of victim’s wife Bimla, a case of murder had been registered against Sahil, Surjit and Kalu who managed to escape after committing the crime. The police reached the village and conducted preliminary investigations. “We have formed four police teams to arrest the accused,” said DSP Darshan Lal Malik. A land dispute was suspected to be the reason behind the murder, he added. The AMOs working in the government’s AYUSH hospitals and dispensaries today wore black badges to work in protest against non-acceptance of their demands. The AYUSH department provides healthcare facilities in ayurveda, sidha, unani as well as in homeopathy, though most of the doctors working in Haryana in this department are Ayurveda graduates. Dr Saroj Bala, president of the Haryana AMO, UMO and HMO Association said Ayurvedic/Unani/Homeopathic Medical Officers working in Haryana were perturbed over their long-standing demand of pay and status parity with respect to their counterparts of other streams. She alleged that indecisiveness of the government in this regard had been denting the confidence of the cadre of AYUSH doctors of the state, hampering their attentiveness on duty, which might have an adverse impact on beneficiaries residing in remote rural areas. “Doctors in the AYUSH Department have been giving representations at all levels since long, but to no avail,” she added. She said Pay Anomaly Committee meetings in which agenda for upgrade of pay scales of these doctors was enlisted had been cancelled twice. The police today arrested Jag Ram, a teacher in Government Middle School here, under Sections 354-B (act with intent to disrobe a woman), 341 (wrongful restraint) and 506 (criminal intimidation) of the Indian Penal Code (IPC) and Section 10 of the Protection of Children from Sexual Offences (POCSO) Act. The victim’s family alleged that for two days, it was being pressurised to strike a compromise with the teacher. Since the family remained adamant, the police registered a case yesterday. The police, meanwhile, arrested the victim’s father and his friend today on the charge of assaulting the accused teacher’s wife. They were booked under Sections 354-B, 452 (house-trespass after preparation for hurt, assault or wrongful restraint), 506 and 34 (acts done by several persons in furtherance of common intention) of the IPC and Section 3 of the Scheduled Castes and Scheduled Tribes (Prevention of Atrocities) Act. The case was registered on a complaint by the teacher’s wife, who alleged that the girl’s father and another person, identified as Hawa Singh, assaulted her in her house and threatened to kill her. The FIR lodged by the 14-year-old schoolgirl against her teacher mentioned the date and time of the alleged incident as July 20 and 9 am, while the FIR lodged against her father mentioned the time of the alleged incident as 10 am on the same day. The girl’s family which hails from Hathras district of Uttar Pradesh said that they had no support base in Fatehabad, while the accused teacher was a well-connected person. 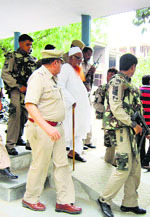 The police produced Jag Ram, girl’s father and Hawa Singh in a local court today. Jag Ram was remanded in judicial custody, while the girl’s father and Hawa Singh were released on bail. City police station Station House Officer (SHO) Garav Kumar said since both the complaints cited commission of a cognisable offence, the police had no option but to register cases and take actions accordingly.